The Guildhall is a gem not be missed. It is open to the public between April and October on Friday, Saturday, Sunday and Monday. Various exhibitions take place in the Court Room throughout the year, and more information about these can be found by following the links below. Entrance to the building is gained by a door on the left situated under a passageway to the right of the Buttermarket in Wilmore Street. The Court Room and Council Chamber are accessed via a set of stairs. Visitors to the Guildhall are able to use toilet facilities. 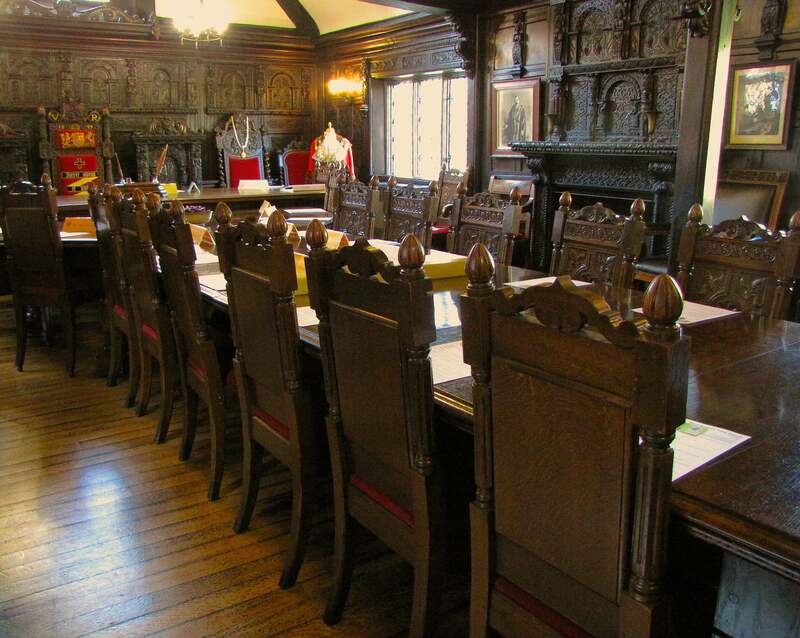 The first room you enter was an active Court Room until 1985. It was built in 1540 after the dissolution of the Priory. Four types of court were held regularly: Petty Sessions and Quarter Sessions, a Bailiff’s Court and the Court Leet or Manorial Court. 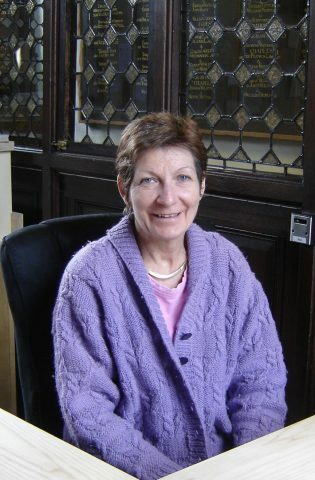 Bailiffs were elected from and by the burgesses. You can see the lists of the Bailiffs on the wall. In 1835 the role of Bailiff was abolished and replaced by that of Mayor. The Quarter Sessions were held under a Recorder, and within the first year, two felons had been sentenced to be hanged on the Wenlock Edge. The Coat of Arms that looks down on the Court Room is that of Queen Elizabeth the First, and bears the date of 1589. The Latin inscription beneath can be read as “This place abhors iniquity, loves peace, punishes wrongdoings, upholds the law, honours upright men”. Note the thrifty way a spelling mistake has been corrected! Small (petty) offences could be punished by a period in the stocks. The last offender to be sentenced was Thomas Lloyd in 1852. The standard weights and measures on display near the stocks were purchased in 1853 at a cost of £87 3s 6d. The next room is the Council Chamber. In the Parish Register of 1577 the following entry appears “Upon the 23rd and 24th day of this month of September was reared the house over the prison house”. The timbers had, of course, been cut, fitted and numbered beforehand, so that when the time came for ‘rearing’, all that had to be done was to fit and secure the timbers. Afterwards they would fill the panels with wattle and daub, and put the windows in place. 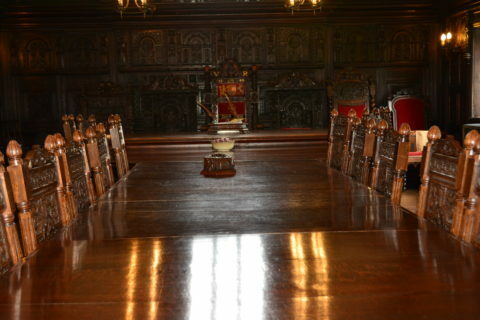 The Town Council meets every month in this Chamber. On the beam which faces the Mayor’s Chair, there is a Latin inscription which can be translated as “Give right judgement and exercise pity”. The open space on the ground floor was the Corn Market until the Corn Exchange was built in the High Street in 1852. At the north end is the old ‘prison house’. 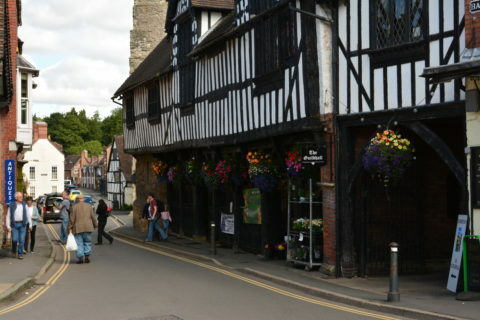 WENLOCK received its Charter from Edward IV in 1468 granting Borough status with very wide-ranging powers, but until 1540 life continued to be dominated by the Priory. With the dissolution of the Priory, law and order became the direct responsibility of the Burgesses, and it was deemed necessary to build a Court House as a priority. Richard Dawley, one of a family of carpenters, was entrusted with the work. 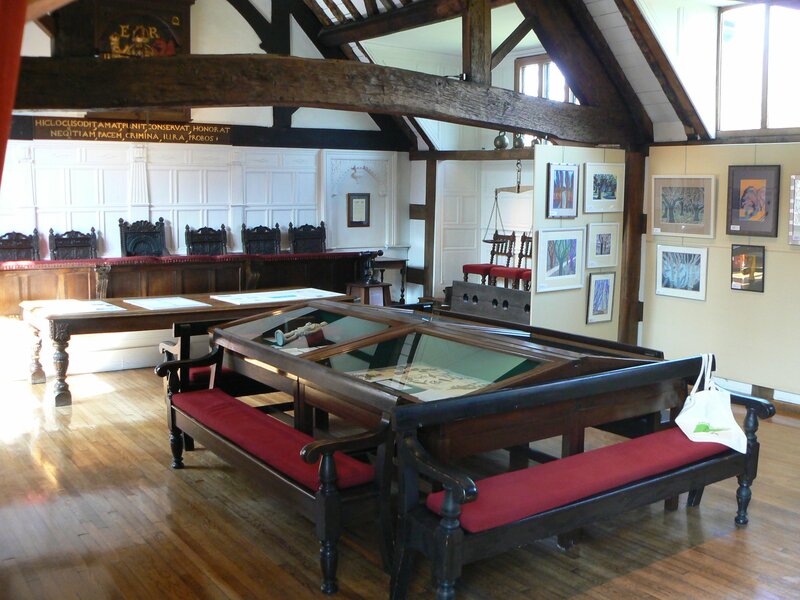 The three-bayed free standing courtroom was erected in 1540. Access was by means of a stairway at the southern end and the ground floor, later used as a corn market, appears to have been open on all sides. Richard Dawley was paid £13 6s 8d for building the Court House (nails cost a shilling, the clock £1). 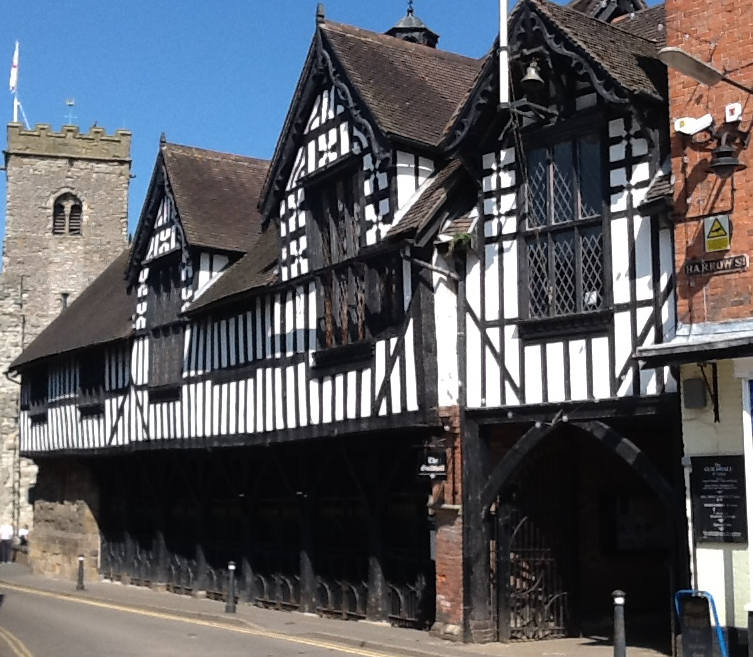 Edward Brower was paid 13s 4d for roofing the belfry with lead and “wine given to various men as a reward” cost 4s 9d. Within a few months, two men were tried, found guilty of felony and hanged on the Edge Top. In 1577 the Vicar noted in the Parish Register “upon the 23rd and 24th day of this monthe of September was reared the house over the prison house”. This was the present Council Chamber built partly over the medieval stone prison at the northern end, and extended to abut the previously free standing Court House. The timbers had been cut, fitted and numbered beforehand as was the normal practice with timber framed buildings. When the time came for ‘rearing’, all that was required was to raise and fit the framework together, secure the joints and fill in the panels and insert the windows. 1616 saw the building of an “inner room” in the Court House “ffor the more Comendable & safe keepinge of the Recordes of the Court and of the Recordes of the Sessons”. Conditions were far from ideal for Council meetings. In 1624 it was decided to undertake a major refurbishment of the building, including “Lattinge and plasteringe the Comon gaole overhead To Keep the Smoake and Nesty Smell” out of the Council Chamber. It was probably during this time that the two tall windows on the west side were inserted. A privy was also added to the Inner Room. Extensive alterations were carried out in 1719-20. 8000 bricks costing £4 were bought for casing the east and south sides and part of the northern end of the building. A new cupola was built, new casements made by a local blacksmith, a new chimney built on a stone base, the roofs repaired and a new pillory provided. Nails on this occasion cost £6 13s 4d. In 1868 the Borough Council decided to erect a retiring room and a water closet for the use of magistrates at the southern end over the passage to the churchyard. During the following year it was resolved “that the two cells under the Town Hall be thrown into the Butter Market” but in the event the northernmost cell was retained. In 1891/2 further alterations took place at the southern end. The stairs were reversed to rise from east to west and then encased in brick and the existing entrance to the building formed from the churchyard passage. A major restoration of the Courtroom was found to be necessary by 1970. The brick casing was removed and the east wall timber framing renewed. Most of the furniture of the court was removed and a new central heating system installed. 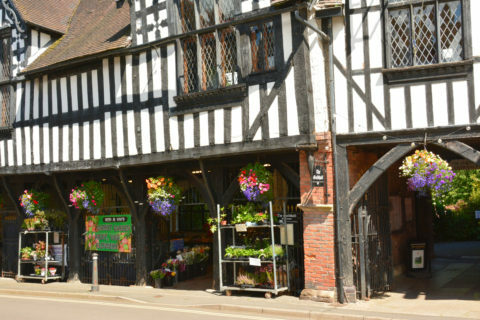 For over four centuries this building was the administrative and judicial centre of the seventy or so square miles of the Borough of Wenlock. Justices of the Peace dealt with minor crimes in Petty Sessions, while the Recorder “one learned in the law” presided over the Quarter Sessions where more serious crimes were tried. The last Quarter Sessions was held in 1951; the Magistrates’ Courts continued until 1985. 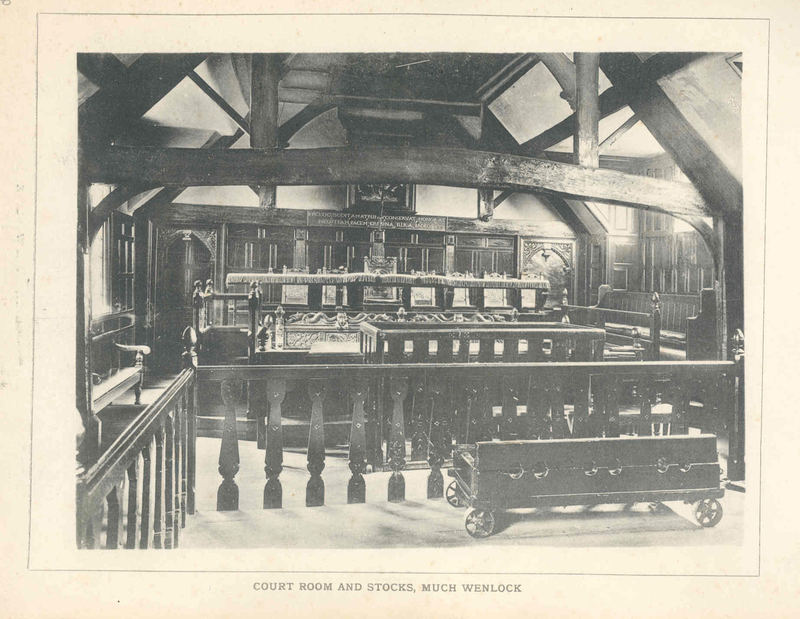 Two obsolete instruments of punishment can still be seen – the stocks last used in 1852 and the whipping post on the ground floor. 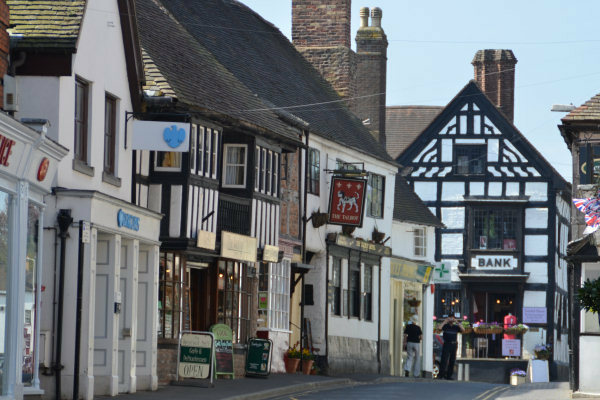 Although Wenlock lost its Borough status in 1966, it retained its Mayor and Town Clerk. The Town Council meets in the Council Chamber on the first Thursday of each month. Vandalism is an illegal, anti-social activity that creates a negative impression of an area and contributes to people’s fear of crime. If you’d like to report any acts of vandalism to council property or anti-social behaviour, please call us on 01952 727509 or alternatively, contact Crimestoppers or the local police station. Join our newsletter to receive up to date news about our the Council.